"In the week before a race, I try to stay away from germ areas. I keep disinfectant wipes in my bag for when I have to use a supermarket trolley or something like that." As far as top tips go for first-time marathon runners, keeping your hands clean is not one that sprung to my mind. Choosing the right shorts, working out where to meet your mates afterwards and booking a day-off on Monday...yes, yes and yes. Taking precautions for dealing with supermarket trolleys? No, can't say I would have thought of that...in a million years. But then I haven't got a young daughter/germ magnet at home and I haven't won six of the seven marathons I've entered. 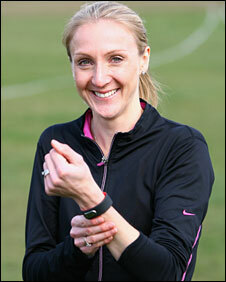 Paula Radcliffe can tick both of those boxes and she can also claim four of the five fastest times ever run by a woman over the 26.2-mile distance. A tip from her comes with a "pay attention" pedigree. "You should have cut down your mileage by now but it is always worth throwing in a little bit of speed work in your final week"
"Stay hydrated and get plenty of rest"
"Make sure you have run in the gear you want to wear in the race"
"Watch out for germ areas - catch a cold now and you'll struggle on Sunday"
"Since having Isla (last January), I've learned the importance of keeping guard against germs. Babies pick up everything going," Radcliffe told BBC Sport. Not that she is complaining about motherhood. On the contrary, she has never been happier. "And you cannot underestimate the happiness factor. It makes for better training and better racing," she added. But with the London Marathon just days away, it is perhaps not the best time to warn the 35,000 or so runners out there that they have rarely been more at risk of catching a bug, cold or fever. Then again, perhaps it is. Forewarned is forearmed and all that. The reasoning goes like this: having reached peak fitness (hopefully), they should now be "tapering" their training in order to make the start line ready and rested. Warning: your natural defences are down and picking up something nasty this week will ruin your Sunday. Now wash your hands. Radcliffe, as you would expect from somebody who has 10 world records (including the marathon) to her name, is full of information like this. Team Paula really don't leave a great deal to chance. The 34-year-old was in London this week to run a relatively uneventful leg of the Olympic torch relay and promote her sponsor's latest piece of training trickery, the Nike+SportBand, but not race in the marathon. Bad news for her, as she has won the race the three times she has run it; but good news for her would-be competitors, for exactly the same reason. An injured toe forced her out of this year's race but with that now healed she will at least be able to enjoy the BBC's broadcast on Sunday morning. "I'm really gutted I'm not going to be able to take part this year," she said. "When April comes around it feels like something is wrong if I'm not running in London. "But I'm just happy I'm not injured and watching it, because that is way, way harder. To be able to do a run, sit down and watch it and then do another run will help me." You and me both, Paula. There's nothing I like doing more than bookending the London Marathon broadcast with a couple of 10km looseners. But, as we've already established, I'm not one of the best distance-runners in history. Radcliffe, on the other hand, undoubtedly is. In fact, an Olympic gold in Beijing this summer - to complete a full set of golds from every major championships and at almost every long-distance discipline - may well make her the best ever. Is this the year Radcliffe will win Olympic gold? So while the toe injury was genuine, there are some who think missing London will prove to be a boon come Beijing. "The anger and frustration at not being able to run in London will be stored up and used fully through the rest of the year, especially in Beijing," agreed Radcliffe, who is now back in training after her lay-off. "My fitness is a lot better than I thought it would be, considering the time I missed. "I think there were eight weeks when I was able to cross-train but I could never quite get back to running. "But I've been back running for two weeks now, so I will be fine for Beijing." As you would expect from people as meticulous in their preparations as Radcliffe and her husband/manager Gary Lough, the four months between now and the Olympic marathon are already mapped out. The bulk of her work will be done in the French Pyrenees but to train her body to cope with the heat and humidity of a Beijing summer she will be mixing in a few long runs at sultry spots on the coast. Sounds idyllic, doesn't it? I should probably point out Radcliffe will be running 145 miles a week by the time she really hits her straps in a couple of months. Of course, it's too late for Sunday's runners in London to reconsider their weekly mileage plans but it's not too late for one final piece of Radcliffe wisdom. So, Paula, if you had only one tip for a marathon virgin this weekend, what would it be? "Erm...make sure you have trained in the outfit you want to wear on the day," she answered. "Oh, and enjoy it! Sorry, that was two tips." And with that she was off for a 5x2km rep session, 10km jog with long strides or whatever it is she does for a warm-down from an interview.